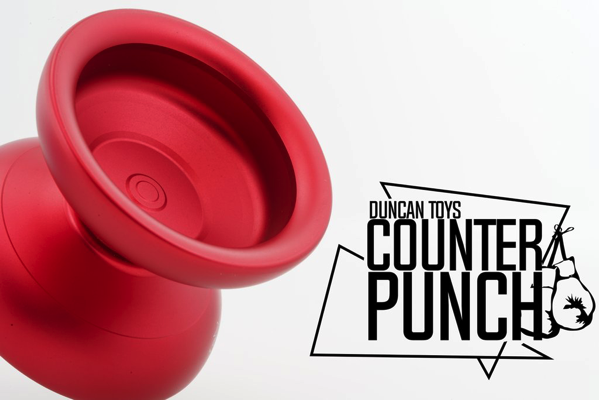 YoYoExpert Blog & Yo-Yo News – New Release From Duncan! The Counter Punch! This latest release from Duncan is a total knockout! Braced to perform in competitive and recreational settings alike, this is the Counter Punch! Impactful and elegant, maneuverable and strong, the Counter Punch melds the float of a butterfly and sting of a bee into one comprehensive package. With wide rims, a sleek profile, and a very comfortable weight, the Counterpunch is a versatile design. Well-equipped to take on anything thrown its way, this full-sized yo-yo has the perfect balance of power and weight distribution to give you a powerful spin and ease of control. Duncan threw you the Haymaker, now here’s the Counter Punch!